Have you ever seen a car made of a wooden chasis?When I was in college, a scientist in the Automotive department have tried to invent the same thing using a Kubota engine and he craft a chasis for it with Bamboo wood. The car actually works and he used it everyday for personal service, we redicolusly call it CrossWind, because there was no windshield for it.Pinoys are truly talented! 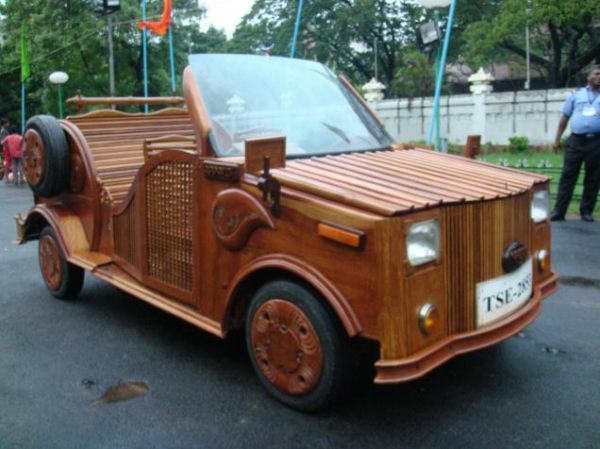 And today another man from India named Appar Lakhsmana, a traditional carpenter from India created a wooden car using a chasis of Maruti 800. Despite getting criticism from his friends, Lakshmana was determined to make his dream come true, for which he got inspiration and support from his wife. Lakhsmana had never driven a car and initially he studied the basics to continue with his lifetime project. His mechnic friend gave some practical lessons and showed the mechanism of a car by dismantling a Maruti 800. After getting the basics of a four wheeler, Lakshamana bought an old Maruti 800. He then removed the steel body of the car and placed dry wood hewn from black bulbul trees. Within a period of two months Lakhsmana designed his wooden fourwheeler and named it Appar 25, a dedication to his 25 years of carpentry career. His stunning car was displayed at the All India Handicrafts Sourcing Show and it was sold for a whopping 280,000INR (Approx. $6,400). Truly a man of faith and courage could do something spectacular and extra-ordinary….